Volunteers groups stay for one month at Nek Chand's Rock Garden of Chandigarh. Accommodation is provided in the mosaic buildings within the garden walls and meals are served twice daily. The cost per person is £350 (GBP) (subject to change). Volunteers work mainly on sculptural and mosaic projects, helping to complete the final phase of the Rock Garden, the world's largest visionary environment. Rubbish collection and cleaning are often the first activities of the volunteer groups before they move on to more artistic work. Other volunteers have carried out surveys, made signage, cleaned water pools, removed graffiti and repaired damaged bangle figures. The next volunteer trips is scheduled for November 2015. Anyone wishing to apply should contact nekchand@rawvision.com. Notes Volunteers are advised to get a tourist visa as getting a work visa is such a hassle and expense and anyway no paid work is being carried out. Travel to Chandigarh is via Delhi and takes 3 hours by train and 45 minutes by air. Flights are from the international terminal and trains from Delhi station. Volunteers are usually met at Chandigarh station but otherwise may have to make their own way to the Rock Garden in Sector 1. Volunteers need to be able to cope with travelling in India and be self-sufficient enough to carry out their own work plan at the Rock Garden if needed. The Chandigarh Administration collect all the gate money to the Rock Garden, about £350,000 per year, yet there is not a clear management structure. Therefore it is not always easy to have an organised work programme or structured activity and volunteers need to be resourceful and sometimes think themselves what might be helpful, and needed, and try and achieve that. The value of the volunteer programme is three-fold. Firstly it gives people who live in the West a great opportunity to stay in a different culture for a month and be involved in one of the world's most amazing visual creations. Secondly it helps make progress with the task of completing the final phase of the Rock Garden and helps with its maintenance and repair, and thirdly it keeps the Rock Garden in local Chandigarh news and reminds the Chandigarh Administration, people and media how important the late Nek Chand and the Rock Garden are to Chandigarh and how much better it must be supported and looked after. 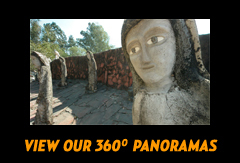 We try to organise some sort of press conference or event for each of the volunteer visits to try and show the international interest and support for the work of Nek Chand.